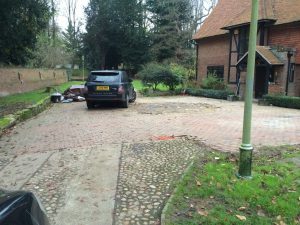 Mark Pateman, director of Thames Valley Landscapes Ltd., was approached by a client based in Temple Weir, Buckinghamshire, to refurbish their existing driveway. The owners of the large, red brick and timber building needed a complete overhaul of their rundown driveway area. With space to park four or five cars for when guests came to stay, the old driveway was suffering from mismatched paving, no structural walls around the area to protect planting, and no efficient drainage system. The team at Thames Valley Landscapes Ltd. set out to re-pave this huge, 350sqm driveway in a way that was sympathetic to the character of the house and surrounding architectural features, such as the lamp-posts and boundary wall. The first step was to remove the block paving and expand the area slightly to provide enough space for further vehicles. Pateman and his team then laid a sub base across the whole area to ensure the drive had enough load-bearing capacity for the cars. They also installed an effective drainage and soakaway system to prevent any flooding. To match the rustic feel of the house, the team used our Granite Setts across the whole of the driveway. The main area was laid in the charcoal-coloured Black, with edging and a central chevron design laid using the Silver colourway. Over 20,000 Granite Setts were laid to cover this immense area. Finally, Thames Valley Landscapes Ltd. built a number of small retaining walls in the same brick tone as the property to protect planting and turf near the parking area. 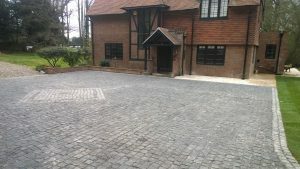 Pateman and his team worked with their client to choose the ideal material for this large driveway, which would be solid enough to withstand plenty of use while enhancing the historic character of the house. Our Granite Setts were the perfect choice. Granite has been used as a paving material for centuries, thanks to its hard-wearing qualities and exceptional durability. 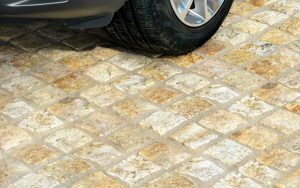 The rugged natural texture and mottled shades make it an attractive paving option for both modern and traditional homes. In this case, the deep Black and contemporary Silver colour options enhance the red brick and timber property, as well as contrast with the surrounding garden. 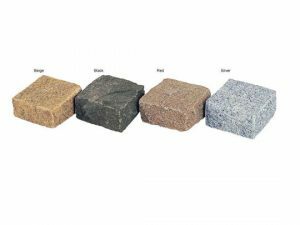 The Granite Setts are also available in golden Beige and warm Red. The apparent simplicity of this project belies a complex, effective building process. Thames Valley Landscapes Ltd. have achieved a beautiful combination of structural security and visual impact that completely fulfils the original brief. Alongside significant ‘below ground’ works to make sure this large driveway could withstand plenty of use, and preventing flood dangers with proper drainage systems, the team used a subtle colour combination of Granite Setts to ensure this expanse of paving didn’t over-power the house’s character. Subtle artistic touches, like the Silver Granite Sett border and chevron pattern, enhance the visual interest of the colour variations in the paving itself. Each individual stone has been laid by hand, giving the drive-way an artisan feel that could only be achieved by using such a time-honoured, attractive material. Thames Valley Landscapes Ltd., based in Berkshire, work with residential and commercial properties to refurbish gardens and outdoor spaces. They’re a member of the British Association of Landscape Industries and work extensively with hotels and business parks to create attractive outdoor spaces. The team pride themselves on sourcing top quality, local materials and using expert talent. They’re also dedicated to encouraging wildlife through appropriate planting, and using sustainable timber wherever possible.